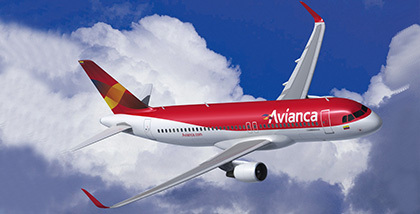 Avianca is again pioneering the operation of aeronautical technology, being the first Latin American airline to incorporate this type of aircraft to its fleet. Pursuant to its plan of fleet renewal, Avianca incorporates its first Airbus A320 aircraft equipped with sharklets (shark fins), making it the aircraft with highest performance and eco-efficiency within its category. The aircraft, which according to list price is valued at US$ 82 million, is the first equipped with sharklets, out of a total order of 30 aircrafts with this new technology, made by AviancaTaca Holding S.A. to the European manufacturer. In addition to its eco-efficient technology, this aircraft, powered by CFM engines, (produced by CFM International, a global provider of equipment used in commercial and military aircraft), has aerodynamic devices manufactured with composite materials, making them lighter and friendlier with the environment. Its wings with sharklets (shark fins) which are 2.4 meters high, can reduce fuel burn up to an additional 4% compared to the reduction achieved by the previous version of the A320, at the time same that diminishes 1,000 tons of CO2 emission per aircraft per year. Furthermore, there is the possibility of achieving greater operational flexibility, to extend its flight range and broaden the payload capacity. Given the new devices, the Airbus A320 is enabled to operate an additional range of 100 nautical miles or carry additional payload up to 450 kg. compared to the previous model in its category. The aircraft has a capacity to mobilize 150 passengers, 12 in Business Class and 138 in Economy Class, which includes a modern and sophisticated in-flight entertainment system with individual touch screen in all seats and monitors with USB port and IPOD dock. "The incorporation of the first A320 with sharklets to the Avianca fleet, represents an important step forward in the process of technological modernization that the company has been doing, with the vision of providing world-class services to our customers. With this aircraft, we ratify Avianca` s leadership in technology, as well as the beginning of a new era of efficiency and operational performance", said Fabio Villegas, CEO of AviancaTaca. Avianca, TACA and its subsidiary airlines currently operate more than 100 Airbus aircraft, 98 of them part to the A320 family. In total, AviancaTaca Holding has purchased 190 Airbus airplanes; 74 are in manufacturing process.